Making cutting boards requires a mid to expert level of woodworking skills, depending on the specific project that you undertake. Note: You want to make cutting boards from closed grain wood species such as maple. Oak is an open grain wood species and hence, food can become embedded in the grain. Note: When finishing your cutting board project use mineral oil or salad bowl oil . Do not use oils such as olive oil as they will go rancid. It is important that you oil your cutting board on an ongoing basis. Once a day for the first week, once a week for the first month and then once a month from that point on. 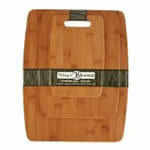 Note: Use a waterproof adhesive such as Titebond II which is approved by the FDA for use on cutting boards. Selection of manufactured cutting boards .